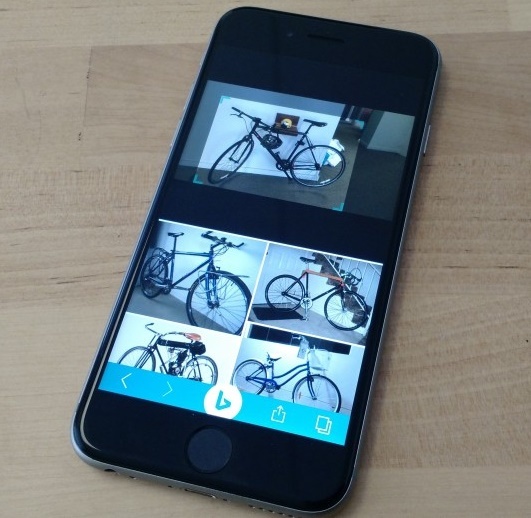 Bing has brought a new update to its app for iOS where users can search images by taking photos. This means you can take a photo and crop a definite or characteristic part of the photo and then search Bing to get more image results that bear resemblance to the photo uploaded by you. This feature is definitely cool and has only been available to Bing for iOS. Windows Phone and Android handsets have not yet received this update. The new feature has not yet arrived for Google app for iOS or Android, or from Yahoo’s mobile apps, etc. As mentioned earlier you need to select any photo from gallery or take a snap and then crop the image to get more directed search results. You can then share the search result with different apps. The first round of testing hasn’t been fruitful. Image recognition which is the basis of the update is not working perfectly. As of now the photo recognition feature works well for visual search queries but not for graphic queries. For example, if you try to compare logo of a company and want to get different images of the same companies logo, you may fail. The search results will show many different logos. Many companies have tried to introduce this type of functionality but those projects did not excel so far. For example, Google Googles, Baidu Research etc. But none of the apps was updated for long time.